Over the last few years, I’ve become a big fan of Sokoban puzzles, such as Go to Gold and A Good Snowman is Hard to Build. They involve pushing items around a board to their goals and are usually tricky but relaxing, harder on my brain than on my reflexes. They also involve a certain amount of trial and error, but can’t really be brute forced. You usually make mistakes, then figure out where you went wrong and fix them. 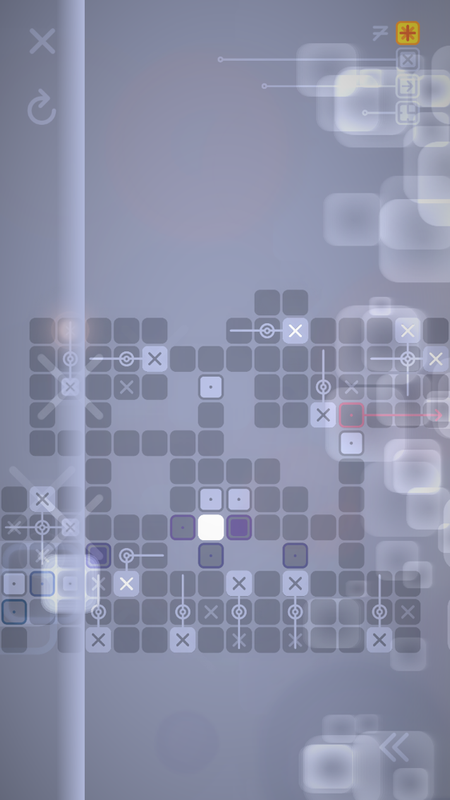 While I didn’t know that much about Polyphonic LP’s Sokoban puzzler, Resynth before playing it, it did look like an interesting twist on the genre, so I was excited to give it a try. Normally, I try to finish most or all of a game before reviewing it, but due to unique circumstances, I decided to review Resynth based on my experience so far. As a puzzler, I like the game quite a bit. You use simple swipe mechanics anywhere on the screen to slide a little white box around a maze. You can swipe one move at a time or hold your finger on the screen to make it go faster. Your task is to use this little white box to push other white boxes around and into their goals. Thrown into the mix are boxes that spin in around a short radius when you push them, as well as goals that can’t be filled until you trace the arrow connected to it. 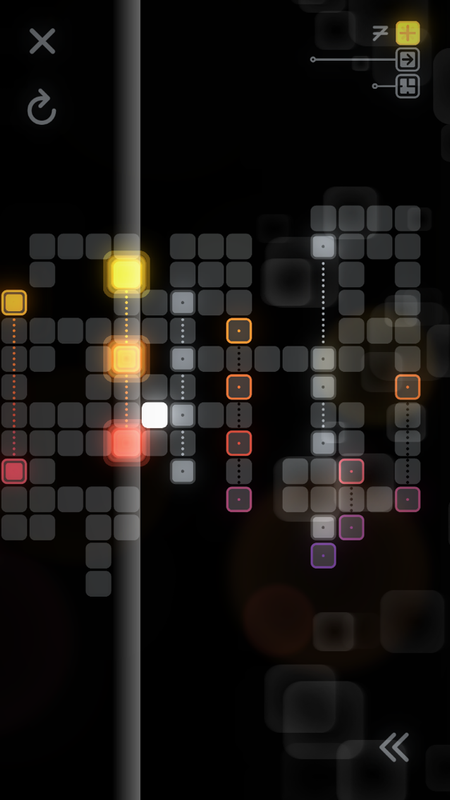 Later levels will even have you pushing boxes that are connected to each other or controlling two playable boxes at once that move in sync. Coupled with some narrow passages to squeeze your way through, and a simple idea becomes challenging. It can be pretty tricky at times, and you can end up backed into a corner if you don’t think things through and plan ahead. This means that even though there are only seventy-two levels in the entire game, it will still likely take you a while to complete. I much prefer fifty to a hundred well-designed puzzles than hundreds worth of filler, so this is a plus in my book. The game checks off a lot of boxes for what I like included in my puzzle games. There’s an unlimited rewind/undo button that can be pressed once to undo a single move or held down to rewind faster if you made a mistake further back but don’t want to restart completely. The undo button isn’t in the best location, as I sometimes hit it by accident, but that’s a small issue. 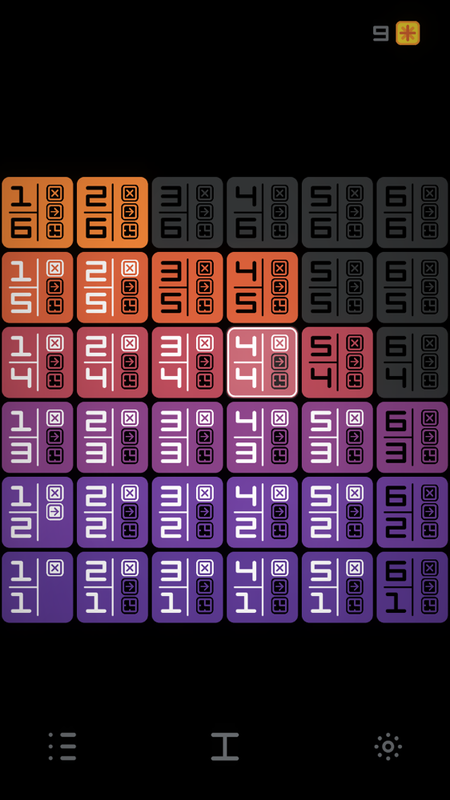 Levels also unlock semi-linearly, allowing you access to multiple new puzzles at once instead of forcing you to play one at a time in a strict order. I always appreciate this in games, as everyone is different and will find one level easier than another. It also keeps the game from becoming tedious because you’re stuck on a level. Resynth also has iCloud sync, so you can go back and forth between your iPhone and iPad, depending on which size screen you feel like playing on. It’s a rare feature to find, even with big budget games, so it’s nice to see a smaller independent developer including it for those of us who value that feature. So if there’s so much to like about the game, why am I reviewing it without finishing most of it? Well, here are my caveats. First off, there are bonuses for completing a level in a certain amount of time or number of moves. You can ignore these, but if you do you’ll only earn thirty-six stars of the fifty that are required to unlock the second puzzle pack. If you can’t do that, you’ll have to pay $0.99 to unlock the second half of the game. Once you have both unlocked, you’ll be able to get enough to unlock all the different themes, but locking half the game behind time and move bonuses or a paywall seems wrong for a game that already cost money to get through the door. There’s also a lot going on in each level, so counting moves or rushing through it doesn’t really fit well. It’s fine if they’re there as an option, but not everyone wants the extra challenge. Forcing them to put up with an aspect they don’t like or pay up is not very user-friendly. It’s surprising for a game that took pains to be so accessible in other ways to then force players to race against the clock against their wishes. (Edit: It came to my attention that you get ten bonus stars for completing the first pack, so it’s not quite as bad as I thought, but still it seems unnecessary to do it this way.) But as unfortunate as it is, this isn’t what prevented me from completing the game, as the developers provided me with a promo code that unlocked the second puzzle pack for free. My main issue with the game is one of its main selling points, which I’ll discuss below. So, the developers are called Polyphonic LP, and they like to focus on joining games and music, so the music isn’t just background noise but a big part of the experience. What that means for Resynth is that as the music plays, a white line makes its way across the screen. As it does so, it picks up new beats from each of the boxes it passes over. It also causes them to pulsate, sending ghosts of the boxes flying at you. It all seems very cool at first. And when there aren’t too many boxes on the screen, it’s not much of a problem, especially if a level can be completed fairly quickly. The tunes are even catchy at first. 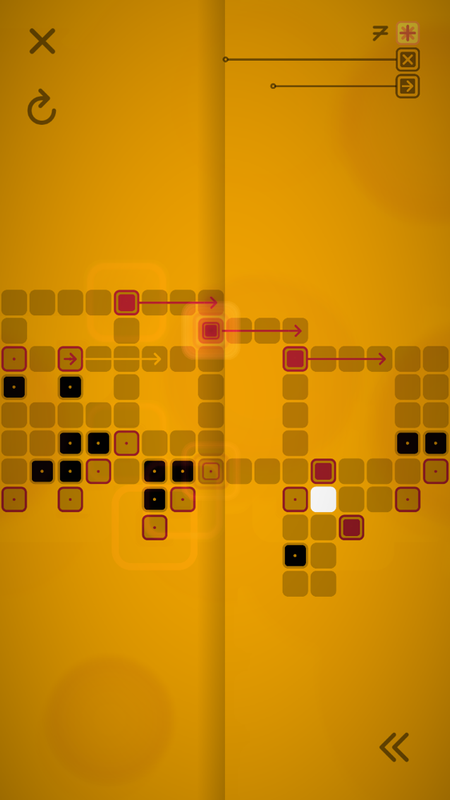 But as you progress, puzzles will be bigger and include more boxes. They also get more challenging, so you may find yourself stuck in a specific level for a while, trying to figure out how to solve it. In most relaxed puzzle games, you can just look at the whole board, take it in, and think over your strategy to see if it would work. But the music and visual effects that make the game stand out are also what make it nearly unplayable for me. I’m trying to take stock of the board and see how to avoid the jam I keep finding myself in, but the same few music beats keep repeating while the pulsating visual effects block my view. Together, they distract me and pound in my head, to the point that I get annoyed and close the game. Every time this happens, I try going back later to give it another chance. Occasionally, I persevere and solve a level, but most of the time I close it out of annoyance. It’s like trying to focus on something and a friend is flicking your ear the whole time. As much as I like the puzzles themselves, I’m just not masochistic enough to deal with the headache-inducing effects. The good news is that I spoke to the developers and they want to make the game more accessible, giving options to turn down the effects. But the update that would bring this welcome change is a ways off, and I don’t see myself finishing the game in its current state. If you watched my gameplay video above and thought you’d be bothered by the sound and visual effects over time, you might want to wait before buying. Also consider whether you’re ok with the time and move bonuses to unlock the second half of the game. If you don’t think any of that will bother you or you don’t mind grabbing it now and waiting for the possible update, you can download Resynth here.